These are monkfish... needless to say I didn't show Cassi what type of fish we were eating till dinner was over ! Another Monday that had me heading straight to the fish market from work. As the pedals turned I started to crave something new and exciting as well as some oysters... we have started to really really enjoy them and they are pretty reasonably priced @ $ 1.25, each not bad... Anyhow I arrived @ Harborfish to see they had 6 different varieties of Maine oysters to choose from... I picked three types and grabbed 2 of each. From there it was over to the fish section where everything was pretty typical considering its winter in the gulf of Maine. 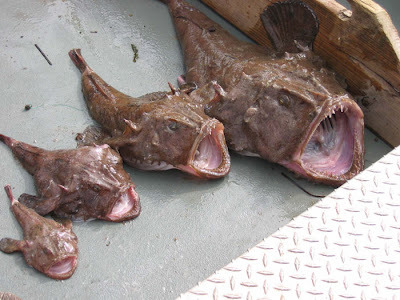 In the summer, you get alot of different species following the gulf stream from south to north and there is much more variety but for now mostly cusk, cod, halibut, pollock flounder etc One fish that I've always eyed but shied away from was the infamous monkfish. A truly grotesque fish who's head is gigantic with a huge mouth (see last picture above). Anyhow they had a fairly reasonable price on monkfish loins, 7.99/#. I decided to give it a shot and ordered up a little under a pound, 2 cuts. From there it was off to meet up with Cassi who was also out running errands... she surprised me with a book Ive been looking for since my friend Todd has raved about it. "Nourishing Traditions". I was so glad to finally have a copy in my hand and it was truly a sweet surprise ! From there it was over to whole foods for a little kitty food and some shampoo for Cassi... then a nice trek back to the west end where I got to work in the kitchen and finished the evening off with a glass of wine and a movie.